The latest definitive guide to the European construction sector. 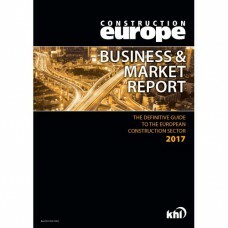 Using KHL's own data and figures from FIEC (the European Construction Industry Federation), this report provides invaluable market information across the continent. The Construction Europe Business & Market Report features the CE-100 guide to the top contractors, as well as the latest details of more than 150 of the largest European contractors. In addition, there is a look at infrastructure investment, project financing, Brexit and technology on the jobsite of the future.